Which will be the score distribution for the tasks? :-? 500-1000-1500-2000-2500 ? I could only get the first three pics (using google translate, nothing special: I really can't get a word of Russian). 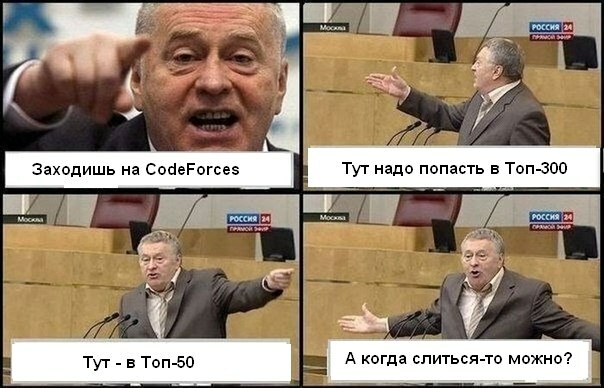 The first says: "Join here in Codeforces". The second: "You! You've got to get on the top-300". Third: "You -- on the top-50"
I can't really understand the last one. Any hint? Here I must be in top-300. There I have to be in top-50. And where I can fail? Approximate meaning: 1)I enter Codeforces 2)Here I need to get in Top-300 2)Here I need to get in Top-50 4)When will be the round which I can fail? You can ask me how to fail! Official and unofficial contestants will be in separate rooms. Then, I think, you should give answer with more than 6 digits after the comma. 3.3333333*3 = 9.9999999. The difference then will be 0.0000001, while allowable deviation is 0.0000005 I guess, since the answers are rounded to the nearest number with 6 digits after the comma. i think the answer is not -1 Because, actually, there is a way to seperate the 10 cola. 10/3 for every bottle. Remember, our real world is continuous! but for computer, because of the accuracy problem, we cannot express 10/3 in fraction, so the answer is 3.333333. The answer is not precise, but it doesn't mean "no solution"
I have the same doubt. I challenged with 3 5 1 2 3 with hope of the correct answer is -1, but the official solution gives 2.666667 1.666667 0.666667 Apparently, 2.666667+1.666667+0.666667 is NOT equal to 5 in maths. Computers can't do float arithmetic accurately but that's not the point here, the problem is the result is not consistent with the statement, i.e, the bottle can't be empty at the end with such/any physically feasible distribution. In fact, 11/3 is not a finite fraction, while 11/4 is. So I think this problem is of flaw. A sample case for this condition would have helped during the contest. MinCostFlow. Vertex is a time, and work is a edge with capacity=1 and cost=-C. We need to find minimal cost flow not greater than K. V~1000, E~1000 and you even don't need Dijkstra's algorithm with potentials. isn't E close to comb(n,2)? No. You not only edges corresponding to works, but also you need edges from t to t + 1. I've read the statement. As I understand: solution = binary search by the answer + greedy. So It can be solvable without [moncost]flows. Idea of solution is really similar. But the problem itself, as I see, no. D and E are too hard, and C is an old problem -- look : http://poj.org/problem?id=3680 Very unfair. Yes, it is a bad idea to use existing tasks in general competitions. I agree, it's not good idea to use old problems. http://www.codechef.com/NOV10/problems/OVENTIME This problem is another similar (and harder) version of problem C.
When will be our ratings updated? It's one of the most thrilling match that I have played. In the first half hour, I did really stupid things(Misunderstand the Problem A, and then make 7 wrong try), and get very inpatient. Then I found 30+ minutes pasted and my A got only 180pt, it was really desperate. Fortunately, I came up with the solution just after reading the problem B. And for problem C, I got very sad when I found it was a very classical min-cost-max-flow problem . I have just re-installed my OS, and I haven't copy the code-library. So it costs me about 10 minutes looking for my code in TC. And the most thrilling part is waiting the result. My rank was 67 before start testing. When my code is running, I got very intense. I think that the tests for the task B are too weak. I resubmited my solution 2 times, whilst the first incorrect version passed: http://pastebin.com/EztLGpMY . it returns 2, whilst correct answer is 3. Can somebody please give the test 22 for the task A (it would be even better to get the shorter version of it)? Edit. Ok I found easier counterexample for my solution, no need for this test now. So I just fixed my time out in B... By switching from cin to scanf... (and now I pass with 0.7s worst time). Guess the big input warning was missing in the warning. I find this very strange though, cause I don't remember having issues with 10^6 inputs before. Maybe it is that all the ints are in the same line and cin uses some sort of buffer for lines? I have no idea. Maybe now judge machines became faster, but I remember that before even 10^5 integers were causing time limit when reading by cin>> . IMHO, time limit for this problem is too strict. O(nlogn) looks reasonable for n=10^6. But I couldn't make it pass even with faster IO. Same thing happens to me ... tle for using cin ... may b psetter should b little more responsible to give warning in such kind of huge input limit . It's common knowledge that in order to use cin for big inputs you have to use: ios_base::sync_with_stdio(0); This 1505453 is your submission with this line added. The limit of 10^6 is entirely normal for such a problem. Maybe it was also meant to rule out slow O(n log n) solutions. And what is the point to rule out O(n log n)? I actually have a hard time thinking of a problem in which banning logarithmic factors actually made the problem more interesting rather than more annoying. (This effort to add artificial difficulty to B seems strange considering how they left a standard Max Flow problem in C). If they want to enforce scanf or esoteric common knowledge, that's fine but they should at least include the usual warning about that. That is a more philosophical discussion (and, for example, problems on TopCoder are much different in this regard from ACM or CF). I believe that authors may choose to require a faster (asymptotically or practically) solution from the participants if they believe that it is important for the problem. In fact, time limits are often chosen so as to rule out programs with too high a constant (time limits on CF are actually quite loose most of the time, but make sure to visit CodeChef for some really painful series of TLEs ;) ). That being said, differentiating between O(n) and O(n log n) is very hard, because an nlogn solution with a FastIO implementation (own i/o parsing, much faster than scanf) often runs faster than a vanilla O(n) implementation. But there usually is a real difference between O(n log^2 n) and O(n log n). Thanks for the common knowledge anyway. It is amazing but this makes cin faster than scanf (makes sense seeing how it does the "%d" part in compile time). I guess the issue is that you cannot use scanf anymore, not going to miss it. 1) "When our ratings will be updated?" 2) "Ok, so now how do we get our T-shirts?" 3) "When we will get our tickets to final?" 4) If some competitors above us are unable to go to finals, can we get replaced? Do we have official responses to our questions now? When should we expect the editorial? I wonder that who take charge of this contest. Who is the administrator that we can talk to? There is an "in case of any questions" e-mail address in the finalist form. Question to needing-visa finalists: Has any of you received invitation letter yet? what is the pricture behind si=max??? Does there any dp solution exist of problem C (Machine Programming) for small constraints? Someone please give hints for dp solution. Server time: Apr/23/2019 10:07:54 (g2).